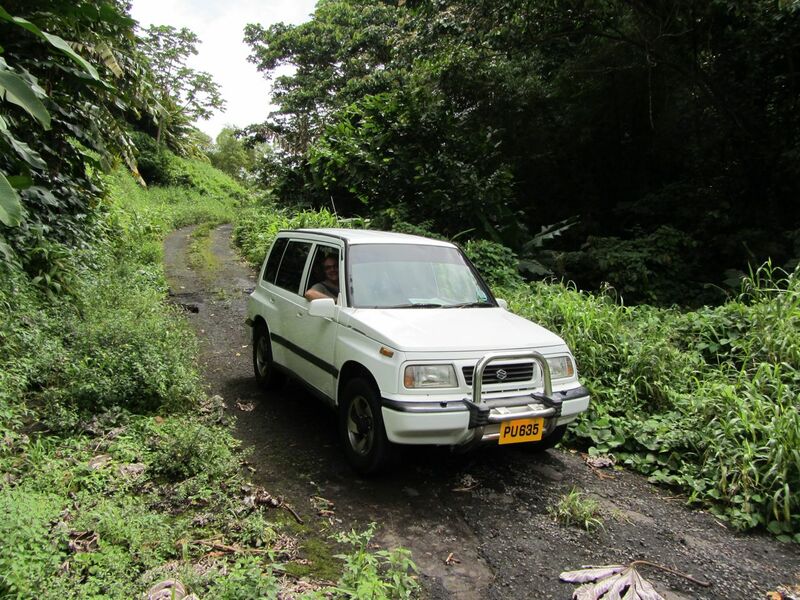 Driving in Grenada best done by a Brit who missed his calling as a rally driver and responds quickly to panicked shouts of “keep left” from the back seat. Fortunately, we have all that and more in Tony Day. We got the tourist map of the island and, on day 2, decided to drive from Gouyave to Grenville across the northern half of the island. 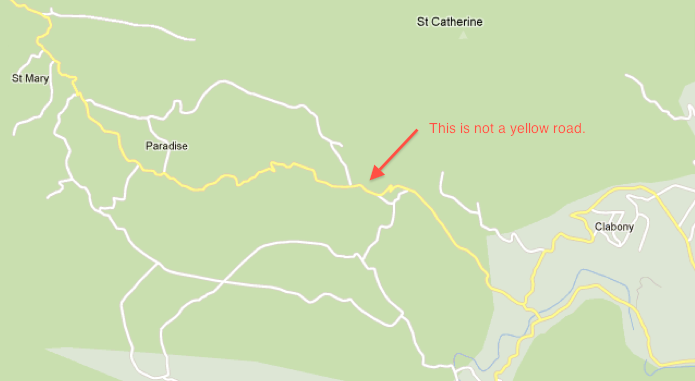 It was marked as a yellow road: the best roads on the island are yellow. We’d driven yellow roads and also the secondary white roads around the south coast of the island with no problems. So, we assumed that this yellow road across the north would be fine: paved, two lane, etc. BAD assumption. Miles of the road was an unpaved, potholed, single-lane, steep track. We didn’t pass another vehicle (thank goodness; we’d have had to back up for miles to find a passing spot). Maybe, the road is only used by banana trucks during the week. And Google maps on the ipad also clearly showed our banana-track route as yellow. Our driver is grinning. Gayle, Jane, and Pete got out of the car, terrified of the pot hole on the steep road ahead. When Tony suggested pulling off onto a white road from this ghastly yellow road, there was mutiny. We’ll never know if it was the mutiny or onset of a torrential downpour or the strong smell of burning transmission fluid that dissuaded Tony. Tony to the rescue. I certainly would have voted for the white road….how bad could it have been??? Love your posts! You are really making me miss the Carribean. Sounds like a wonderful adventure – thanks for sharing the “moments” and I hope we get to see you along the way. And then Tony rolled up on the shire in Olympic stadium and turfed it. Letting Pete out at the tree on top to whiz whilst waving to the queen.